Prominent & Leading Exporter from Mumbai, we offer scaffolding h frames and h frames. Innovation is our forte and we strive to design and develop a precision engineered range of Scaffolding H Frames. These products offered by our organization are stringently quality tested under various parameters and are flexibly designed in compliance to the set international quality & safety standards. Our products are applied for carrying beams supporting floor forms. These are highly adjustable and are used for carrying beams supporting floor forms. We offer H Frames. H Frames consists of rigidly welded frames of maximum three vertical and two or more horizontal elements. The frames are connected by scissor cross braces through pins with spring clips or gravity locks that are welded on frames. By utilizing one size or a combination of varying sizes of H Frames, towers or an array can be erected to the exact height required for the job. These frames can also be erected on varying ground levels like staircases, etc. Using cross braces and selection of the locating pins on the frames, platform span up to 8' (2400 mm) can be achieved. 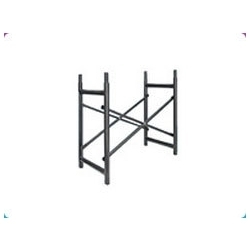 This rigid sway free structure has no loose fittings and no tools are required for erection.It can be quickly and easily erected even by unskilled labour without any supervision of a structural engineer. 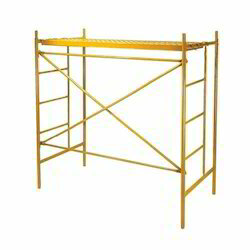 Looking for Scaffolding H Frames ?